Chapter 6: First day. This expert recommendation is part of a series on helping students engage productively in active learning classrooms. When students come into your class, they may not be expecting the energy and risk that an active classroom demands. The first day (or really, the first week) is particularly important for framing the norms, expectations, and rationale for your class approach, tapping into students’ internal motivations and creating a supportive class community. This chapter focuses on activities that can be done in an active learning classroom in the first week of class, to increase student engagement throughout the semester. 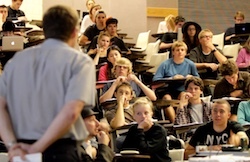 Why is the first day of class important for creating student engagement? The first day is particularly important in any class, but particularly in a class that will be centered on active learning. Students may need to be oriented to their role in the classroom, and you can seed productive structures and patterns of interaction. Here are some things students may be wondering as they enter your class. How does this class work? Students may enter the classroom with a range of expectations based on prior experiences. Making it clear what this course will be like (preferably by jumping into active investigations), and explaining how students will be evaluated, helps to set clear norms for engagement (Gaffney and Whitaker, 2015). How do I get a good grade? When students don’t know how to be successful in your course they may be anxious or resistant. Students often fear that their grades will suffer in an active class because they aren’t sure how to succeed (Ellis, 2013). How does this style of instruction help me? Students often feel that active learning requires more of their time and effort (Ellis, 2013), without providing them clear learning advantages (Seidel and Tanner, 2013). In one study, when instructors explained the purpose of active learning activities, students placed higher value on those activities, reacted to them more positively, and evaluated the course more favorably (Nguyen et al., in press). Will my contributions be valued? In a traditional class, this would be a non-question, so you may need to work especially hard to set the standard for a classroom in which all feel safe and valued in their contribution, and students want to participate – because it’s the norm, and it helps them learn. Many of these questions are directly addressed by the topics in the rest of the series of chapters on student engagement, and I recommend that you peruse them for a broader perspective. Below are several strategies to consider for the first day. For an overview of different philosophies and approaches, watch this 2-minute video of instructors’ goals on the first day and this 5-minute video of how their approaches have changed over time, and by the type of class they teach. Make sure that students know how class will be conducted, the goals of the course, and why you are teaching this way. This helps to establish clear expectations. Hear from several seasoned instructors in this 5-minute video on laying out the course approach, and this 2-minute video on dealing productively with administrative issues on the first day. Rather than reading from the syllabus (relegate that to a Syllabus Quiz), try some more engaging strategies for framing the course. Highlight the shortcomings of traditional lecture. Solicit student ideas about the course. Ask students to reflect on their learning. Beginning the semester with active learning strategies sets clear classroom norms for interactivity. Hear from several seasoned instructors in this 5-minute video on establishing expectations for participation. Below are several approaches for introductory active learning strategies which set the stage appropriately for an active classroom. See our Group Skill Building activity for suggestions on forming the first groups, and Chapter 7: Group Work for more suggestions on structuring group work and tasks for engagement. Student engagement is heavily influenced by the culture and norms of the classroom. Think about how to set those norms, and begin to generate an environment that feels welcoming to all students, and establish yourself as a trustworthy instructor who will listen to students. To hear from several seasoned instructors, watch this 5-minute video on establishing a comfortable classroom climate. You might ask, “I want everyone in this class to know each other by their first name. I need ideas of how to accomplish this.” Then, use the strategies that students suggest. You might start class with practice clicker questions to generate a sense of community (such as, “How did you arrive to school today?” “How many of you hate math?”) Use this opportunity to demonstrate productive discussion styles. Use early icebreakers for students to become acquainted. For example, ask them to introduce themselves to their neighbor, and then introduce their neighbor to two other students. You can use the “whip around”, where each student is asked to give a 30-second response to a question (such as “what is your favorite memory of learning biology?”). In large classes, you might do a whip-around by row or by group (Tanner, 2013). For more icebreaker ideas, see this link. By focusing an icebreaker on emotional content, you create a respectful, personal atmosphere from the outset. If you feel that there are issues with students not feeling that they belong in your course (e.g., a minority of women), consider a Social Belonging Intervention. This is easier said than done, especially in a large class. However, even if you learn just a few names and show that you are always trying to learn names, it sends a powerful message. On the first day, you can ask students to write their names and a few pieces of information on an index card. Carry these around, perhaps adding a photo of the student, and use them to call on students during class discussions. Another idea is to use Table Tents for students to introduce themselves to classmates, and keep their name visible for you and other students. Both of these items (index cards or table tents) can be sorted to create small groups (Tanner, 2013). From the first day, and onward through the course, seek to learn about your students’ interests and clearly connect the course to those interests and goals. This strategy is very powerful for engaging students’ intrinsic motivations, as well as helping them to feel a sense of identity and belonging in the course. To hear from several seasoned instructors watch this 5-minute video on how they tap into student motivation, and this 5-minute video on how they informally assess their students on the first day. You will likely find that student engagement needs a few boosts throughout the semester, as fatigue sets in and students are distracted by other obligations. Here are a few ideas for mid-semester interventions to help boost morale. Use a mid-semester evaluation, such as Stop Go Change, after the first 3-4 weeks of the course. Use this evaluation to show responsiveness to student ideas, to address early issues, and to re-confirm the reasons that you are using active learning. Help students to remember that active learning is useful for them. Consider asking students to complete a weekly insight or other self-reflection, such as a weekly insight or exam wrapper. Discuss the role of active learning, perhaps using the Bloom’s Taxonomy activity. Periodically ask students to complete a self-reflection rubric (see Self-Assessment Worksheets), where they assess their learning skills. See Chapter 2: Metacognition for more ideas. Do you have a task or topic that is highly motivating and engaging, or deeply relevant to students’ lives? Pull it out mid-semester as an energy booster. See Chapter 7: Group Work for ideas on what types of activities can be highly motivating for students. Re-invigorate your use of other strategies. Are you still using productive, supportive feedback? Are students still using their Table Tents? Are you continuing to use language that supports a positive classroom culture? Do students need more support in working productively with their groups? Do you need to remind students of your reasons for using these teaching strategies (see for example “Sermons for Grumpy Campers.”) Don’t overwhelm yourself, but choose a few strategies to try (see the full set of chapters on student engagement). When students come into your class, they may not be expecting the energy and risk that an active classroom demands. The first day (or really, the first week) is particularly important for framing the norms, expectations, and rationale for your class approach, tapping into students’ internal motivations and creating a supportive class community. Here are some activities that can be done in an active learning classroom in the first week of class, to increase student engagement throughout the semester. Make sure that students know how class will be conducted, the goals of the course, and why you are teaching this way. This helps to establish clear expectations. Explain to students why you have chosen to teach this way. Ask students to reflect on their learning. Beginning the semester with active learning strategies sets clear classroom norms for interactivity. Student engagement is heavily influenced by the culture and norms of the classroom. Think about how to set those norms, and begin to generate an environment that feels welcoming to all students, and establish yourself as a trustworthy instructor who will listen to students. Call on students at random to share their ideas. Seek to learn about your students’ interests and clearly connect the course to those interests and goals. This strategy is very powerful for engaging students’ intrinsic motivations, as well as helping them to feel a sense of identity and belonging in the course. Find out about your students. Make explicit connections between the course content and students’ lives. Lang, J.M., Small changes in teaching: The first 5 minutes of class, The Chronicle of Higher Education. (January 11, 2016). Ormond, C., The first day of class, Ormond, SERC, Carleton College.